Panoply Furnishings Ltd. The Coffee Table is available in 4 colours: Espresso, Oak, Walnut and White. 4 Colours - Espresso, Oak, Walnut and White. Available in Oak, Walnut, Espresso, White. Lifting Lid for Extra Height. Here we have our Glass & Wood Coffee Table. Condition is Used. 800mm x 800mm Hardly used the table looks like new! Winning Bidder will be very happy. Corona grey washed effect range: 1 Drawer Coffee Table. Drawer Runners: Solid pine supplied loose. Drawer Fronts: 16mm Solid Pine with REAL Dovetail joints. Drawer Sides & Backs: 12mm Solid Pine. 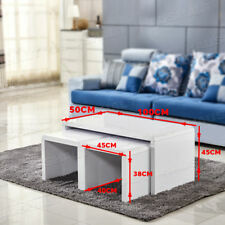 Included in the price: 1 Drawer Coffee Table. Harvey's Crest Glass coffee table. Rectangular shape. Dimensions:127cm L x 71cm W x 45cm H. Black gloss base, chrome legs, very sturdy. Some light scratches on the glass top but in decent used condition. Currently on the Harveys website for £312. Pick up from S36, Sheffield. Glass top can be detached for transport. Rustic Coffee Table Mango Wood? Iron Detailing. Condition is Used. Gorgeous coffee table a couple of paint splatters on top from the kids but would sand off easy enough. Collection Duton Hill or happy for you to arrange your own courier. Glass Coffee Table .120cm X 60cm. Glass Coffee Table 120cm X 60cm. Condition is Used. 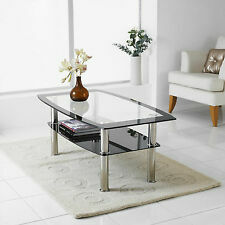 4.5 out of 5 stars - Glass Coffee Table .120cm X 60cm. 90 product ratings90 product ratings - Glass Coffee Table .120cm X 60cm. Black Granite Hexagonal Copper Coffee Table. Condition is Used. Collection in person only. VidaXL Coffee Table Solid Acacia Wood Brown 100x50x40 cm. The table has two U-shaped legs so that it can stand stably on the floor. Material: Solid acacia wood and tempered glass. Garden & Patio. The modern coffee table makes life easier by providing a convenient place to put things within reach. Lovely black coffee table. Never been used, been in storage. Collection only Stoke-on-Trent. Rustic Coffee Table Round. Condition is Used. The Valencia Coffee Table is a stylish combination of glass and wood which is contemporary in application and timeless in design. This coffee table is practical and elegant and will be a genuine feature piece for any living room. The glass top is 12mm thick tempered safety glass with a bevelled edge. We use our own images to show you the actual product we stock. Buy with confidence!. 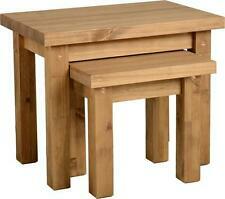 The item featured in this ad is a Two Tier Coffee Table made from solid wood for just £70! Lovely blue colour. Furniture Mill. Glass Coffee Table 102cm X 66cm Height:40cm . Condition is Used. Collection in person only. VidaXL Coffee Table Solid Mango Wood. The clear-faced wood grains make every piece of furniture unique and slightly different from each other. Material: Solid mango wood. Garden & Patio. Sound & Vision. Range: Soho Solid Oak Collection. The Isle of Wight, Isle of Man, Shetland Isles or Northern Ireland. Solid Oak Folding Storage Coffee Table. Solid Oak Coffee Table Extendable Coffee Table. 100% Solid Oak / Modern Storage Coffee Table. If you are looking for Modern Light Oak Living Furniture then the Regal Collection is sure to be the perfect addition to your home. Offering unbeatable value for money this fantastic furniture range is defined by it's smooth lines and contemporary metal bar handles. .
A beautifully minimalist coffee table from this solid oak range. The Kuba range is delicately handcrafted from the finest carefully selected and graded oak timbers. They are given a light lacquer finish to reveal the stunning beauty of the natural oak and to give a layer of protection to the wood. The design is very much in keeping with the look of today but will work in perfect harmony with both modern and traditional homes. Part of our Baumhaus Mayan furniture collection. Superb walnut nest of three coffee tables constructed using solid walnut. This nest of tables is made up of three practically sized coffee tables. Walnut is a very high quality timber with a dense grain, this makes it the perfect choice for building stunning and unique furniture. SolidWood Coffee Table. Can Deliver Up To 10 Miles From Harrogate L110cm W110cm H 40cm. Marks on the legs may need touching up with paint . Walcot Painted Oak Coffee Table / Oak Lounge Table With Shelf Solid Wood / New. The Walcotrange is constructed with solid Oak and high-quality Oak veneers, in picked panels. A solid hard-wearing thoughtfully crafted coffee table with a lower storage shelf, ideal for the busiest of living rooms! Inspired by French Cottage style furniture, the table boasts flared cornices, expertly carved skirting, panelled sides and grooved top. The softly rounded corners and bevelled top add quality finishing touches to this impressive piece. Underneath the large table top is ample space for storing magazines, books or displaying ornaments. The solid oak used in the construction of this piece is brand new oak which has been skilfully crafted to create a look that resembles years of use. Each piece of oak goes through a lengthy process of being seasoned and kiln dried until it is ready to be crafted. The Oslo 2 drawer coffee table is beautiful and functional. The design is very much in keeping with the look of today but will work in perfect harmony with both modern and traditional homes. The coffee table is delicately handcrafted from the finest carefully selected and graded oak timbers and is given a light lacquer finish to reveal the stunning beauty of the natural oak and to provide a layer of protection to the wood. Even the drawer backs and bases are solid oak and handmade using dovetail joints. FREE DELIVERY / HAND CRAFTED / UK STOCK! Finished in a light grey matte paint with a solid oak wooden top the coffee table is a modern addition to any room whilst the wooden top has a hint of traditional charm to the piece of furniture. Painted Matt Finish Suitable for Bedroom. A lovely low bookcase featuring two spacious open shelves and two drawers for hidden storage. The key feature to this collection is the exquisite hand-distressing on the grey limed tops, which is carried out by skilled craftsmen to create the unique eye-catching appearance that makes this collection so distinctive. Combining timeless elegance with a warm, homely quality, the Signature range is modern classic furniture at its absolute finest. The four drawers have internal measurements of H10 x W43 x D24 cm and the flip-top opens to a storage area measuring H28 x W102x D27 cm. Made from a mixture of wood's including oak and oak veneers the piece of furniture is finished to a high standard. The Nebraska coffee table arrives to your door partially assembled. Just attached the legs and shelf and then you can posiiton in your living room ready for use. FREE DELIVERY / PAINTED GREY & OAK / UK STOCK! This lovelycoffee table will bring an elegant touch to your living room. The sophisticated finish a on the drawers all add to the chic feel of this useful, solid table. The solid oak coffee table top has chamfered corners and the putty coloured painted solid hardwood base has chamfered corners on the drawers. Aspen painted grey two drawer coffee table with oiled oak top. Fully opening drawers that pull through from one side straight through to the other. Modern Painted coffee table. Ideal for Living Room. • 100% Indian Sheesham Wood. • The Cube Furniture Range blends Modern and Traditional design. • The largest Cube Furniture Ranges in the UK. Living Room. Dining Room.